I have just had two of the Motorola Moto E phones for both my partner and our daughter, so though would give a quick review of the phone. The phone is available for just under £100 on pay as you go on most of the major networks, or for free on some good cheap monthly plans, we had these through TalkTalk mobile at only £7.50 per month including 300 minutes, unlimited texts and 600mb internet per month. The phone itself has a reasonable 4.3-inch 960 x 540 pixel display, colours are pretty good for a phone of this price, using outside brightness is OK if on the highest setting if in bright light, indoors screen is very usable at lowest brightness, there is auto brightness available in the setting to adjust brightness according to external lighting conditions. The top layer is Gorilla Glass 3, so this is a good tough glass so shouldn’t be able to scratch easily. You do normally only find this type of glass on higher priced phones, so this is a good addition for this price point. is a setting for autobrightness as well. The main grunt of the phone comes from a dual-core 1.2GHz Snapdragon 200 chip, this by modern day standards it pretty low, but to be honest even with this CPU the phone performs well, from loading webpages quick and gameplay, though if looking to play the latest 3d games at full speed you would be best looking elsewhere, but then that would be a lot more money for your device. I ran antutu benchmark which gave a result of 12783, which is good as a Samsung S3 which even now second hand is about twice this price runs at around 16500. It does help that the phone has 1gb of ram as other phones of this price only have 512mb. The camera on this phone is a slight let down, it does have a 5mp rear camera which does take good shots in daylight, but in low low not that good as the phone dosnt have a flash. But for normal use outdoor or in good light the photos do come out OK, but in low light are a but grainy. There also isn’t a front facing camera so no selfies or video chat. You get 4gb of internal memory, which is pretty low for a phone of this spec though you can install a microsd card to boost storage. The feel of the phone is OK though a bit plasticey, weight wise is OK at 140grams, so does have a bit of weight to it, but does feel solid when using the phone. On the front there are two silver bars at top and bottom, these are not purely aesthetic the top one has the earpiece weaker and the bottom is the loudspeaker, this is a great addition having a front loudspeaker, sound quality is not to bad, still can be a bit tinny at times. Android 4.4 kitkat is in its purest form on this phone with no modification that I can see, and the default android skin. Now for me this is good as when manufactures put additional bloatware and skins etc can slow down devices and apps you don’t use or want can’t be uninstalled, just look at Samsung for that. So Motorola have done a good job of keeping it clean and simple. Though they do have some preinstalled apps like alert to help you keep in contact with family and friends, assist to automate tasks like autoreply to texts or silence the ringer volume, Motorola migrate to help switch from another phone. Because it is pure android you have the standard Google apps, like gallery, play music for both local and streaming music, sms/mms messaging, FM radio, calendar, voice search and of cause the play store for loading your favorite apps. On a side note I’ve started using the Amazon store for some apps see what I think of the Amazon store HERE. The only buttons you have are the power button and volume up and down. The power button does sometimes take a few pushes to get it on, but nit really a problem. At the top is a standard 3.5mm headphone jack. To put your sim in which this phone takes the micro sim and the SD card you have to remove the back. When we curt got the phones this was pretty difficult to do, has you have to unclip the top and press the Motorola sign on the back of the case to fully unclip the back, this did take a good few attempts to get right. In the box you only get a USB cable for charging and data transfer, but you don’t get a mains charger adaptor, though these are only a few pounds so not a great loss, but worth hearing in mind if you buy this phone, for tips on USB charging see article I have wrote HERE. For the price of this phone this does seem a great entry level phone, as for around the same price you can get a Samsung fame, S3 mini etc which these phones for the same price are a lower spec in either screen or CPU. So this phone does make a great buy, though Motorola do do the next model up the Moto G, which is nearly the same but does have a flash for the rear camera and a front facing 2mp camera, also a slightly larger 4.5 inch screen but with a higher resolution of 720×1280, 8gb internal storage instead of 4gb, but other than that the same phone, and this is around the £150 mark so if you can afford spending that little extra, I would go for the G model. 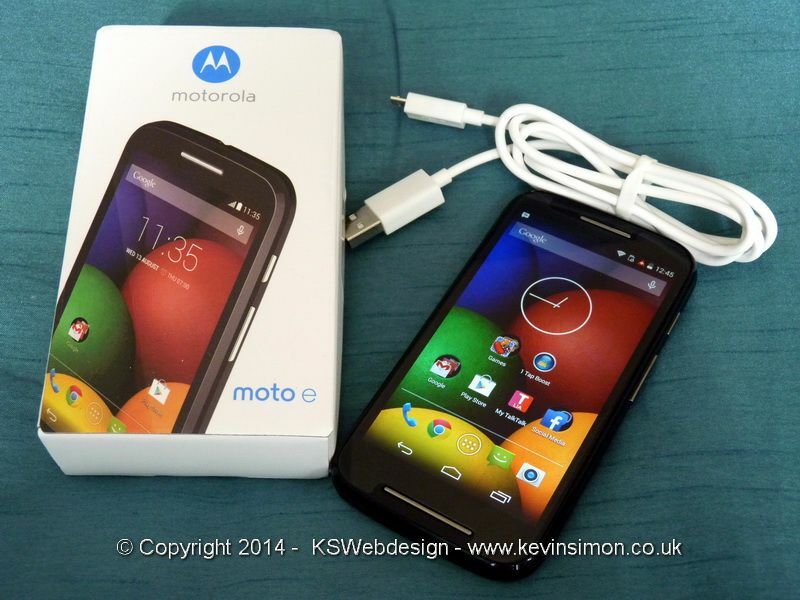 But for a affordable phone the Moto E is a great phone to go for, I’m happy with the purchases of these phones. This phone can suffer from a few problems the common one is the phone reseting for no reason, this happened to one of our phones. For me it seems to be a problem with the power button as the device thinks the power button is pressed permanently down, so turns on and then turns back on. This became a major problem the quick solution for me was to install a app that allows you to unlock the screen using the volume controls. There are other apps that use the proximity sensor or even shake your phone. This gets around the problem as you are not pressing the power button, so the phone dosn’t register to turn off and on. So far it has been a week since installing a volume unlocker and no problems so far.